I had a run in with a piece of rayon spandex jersey this past week. I ended up cutting it with an underlay to keep it from moving around. It reminded me that an underlay is useful for other things besides chiffon, georgette, and charmeuse. An underlay is a piece of paper placed under the fabric that you are going to cut. It keeps the fabric from shifting in the cutting process and going off grain. A roll of plain brown kraft paper works fine. 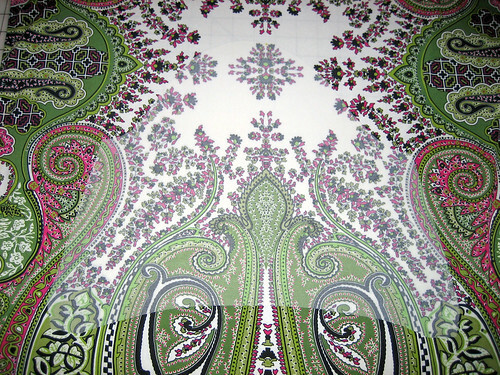 Try to find paper that is as wide as your fabric or your table. If you can’t get the width you need, just add on as required. The paper must be as wide as the fabric you are cutting. An underlay is absolutely required for the best results in cutting very slippery fabrics like silk charmeuse and silk chiffon. I also use it with rayon jerseys where grain and cutting accuracy is important. Place your fabric on the paper after making very sure that you are starting with a straight grain. Its OK to cut multiple layers with a single underlay, just make sure that all are correctly started on the straight grain. If it’s a fabric you can tear, like chiffon, that’s the easiest way to establish the straight grain. Use a t-square to draw a perpendicular line across your paper and align the torn edge along the pencil marking. If you can’t tear it, like charmeuse, you will have to pull a thread all the way across (nerve-wracking I know) to get the grain to reveal itself. For jerseys, I follow the lengthwise grain of the rib and use a C-thru ruler to chalk in a perpendicular line. Use weights to hold the start of the fabric at the line you have drawn at a right angle from the edge, across your paper underlay. Once your fabric is laid out on the starting grain, smooth it out absolutely flat ( a c-thru ruler brushed lightly across the surface to eliminate bumps can help); make sure to place weights on the fabric to keep it that way. Keep the straight grain set on the line drawn, and make sure the selvedge lines up against the straight edge of the paper. Now you have your grain lines established. Pinning will distort the fabric. You can use just about anything for weights, small food cans are fine. I use heavy tape dispensers, staplers, anything that comes to hand. You don’t want to move anything once it’s laid out, so try to get everything laid out in the block of fabric on the table that will fit. If you can’t get all the pattern pieces on it, you will have to lay out another block to cut the rest. 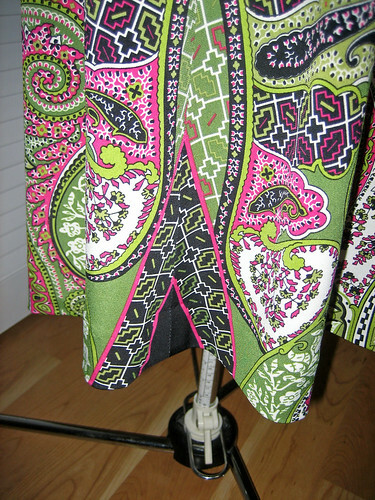 AVOID CUTTING YOUR FABRIC ON THE FOLD, NO HALF PATTERNS! Please note, it doesn’t really work well to cut on the fold when using an underlay (although some have been known to cheat). You risk going off grain and may have to live with the consequences…..So no half patterns! If your pattern piece is meant to be laid on the fold, then take the time to mirror the other half of the pattern by tracing it off on a folded piece of paper. Cut out the paper along with the fabric. (It’s OK, I know they told you never use your fabric shears on paper, but when you cut fabric along with the paper it works fine. I have a pair of huge 12″ Wiss shears for almost 25 years now, and I rarely sharpen them.) Since the paper is lifting off the table and supporting the fabric, the fabric does not shift. 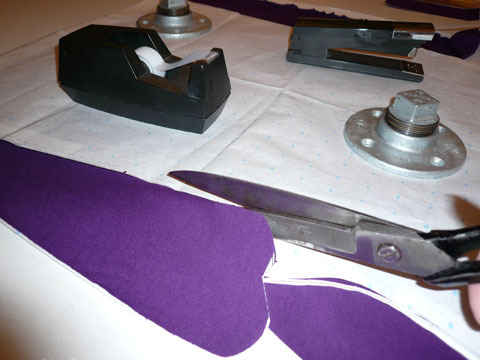 Make sure your weights are not too close to the edge of the pattern, that makes it more difficult to get a clean edge. For those tight corners and curves you can actually flip over the paper that’s already been cut and get in closer. That’s after you’ve been practicing awhile! A bonus of using an underlay is that it can become a record of what you’ve cut. If you are adjusting a pattern on the table, or maybe putting together bits of various patterns for an entirely new garment, an underlay can become your pattern. 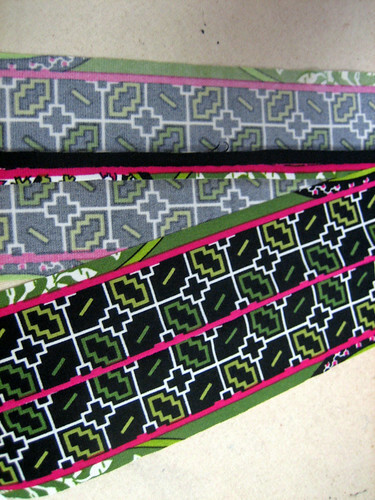 Just be sure to mark the grainline, and pencil in what the name of the pattern piece is and how many to cut. I don’t use electric scissors or rotary cutters, so I don’t know how that works with an underlay. I have used small industrial cutting machines with an underlay, so I suspect that it may work fine. And of course, your scissors need to be sharp and without nicks that could catch on your slippery fabric for the best results. I finally finished my dress today! This fabric was so much fun to work with and I’m so happy with the way it turned out. Luck was on my side as the ties turned out to be long enough to wrap around the back and to the front. They aren’t long enough to tie in a bow but I think they look good just like this. 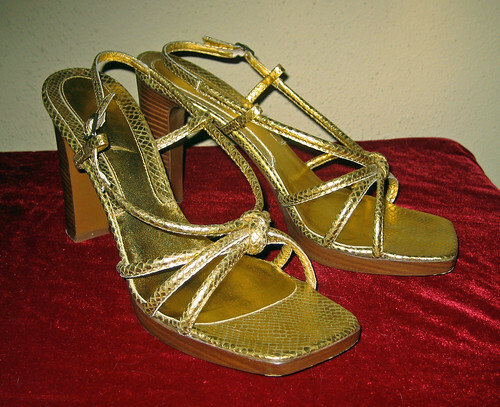 Here are the miters at the hemline. I doubt anyone will notice them because the skirt is a-line but it needed to be done! 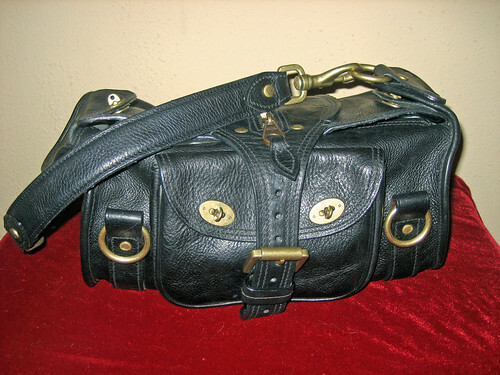 and my black Mulberry bag. I LOVE the casual chic of Mulberry bags! They look like some vintage leather bag you’ve been carrying forever – a true rich hippie look. 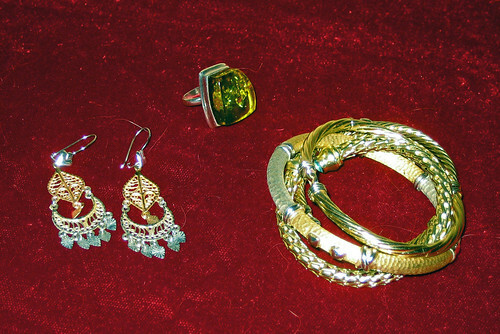 Jewelry: yellow and white gold dangly earrings, an armful of yellow and white gold bangles (these will join the silver and gold Cape Cod bracelet that I never take off) and a beautiful amber and silver ring I bought in Alaska. Last but not least: I meant to mention this in one of my previous posts but completely forgot about it. 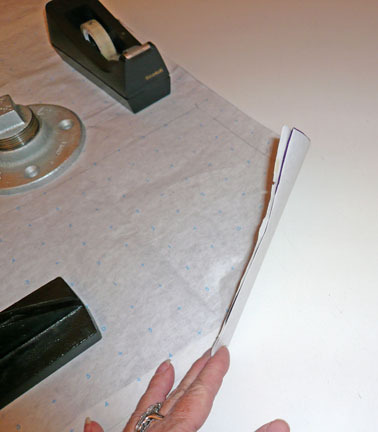 This is the complete idiot’s guide to cutting perfectly mirror-imaged sleeves! Cut your first sleeve then use it as a pattern for the second sleeve by laying it face down on your fabric, matching the pattern exactly. Foolproof! Notice that I centered the motif with the shoulder notch on the sleeve. 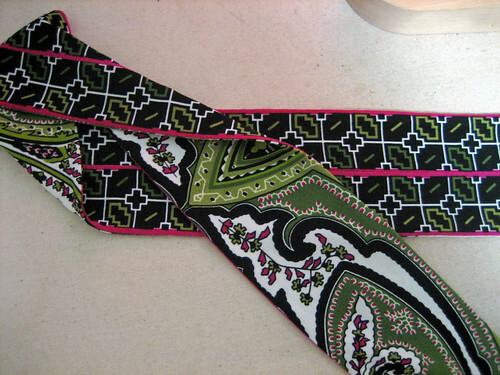 Today I am working on the ties for the dress. 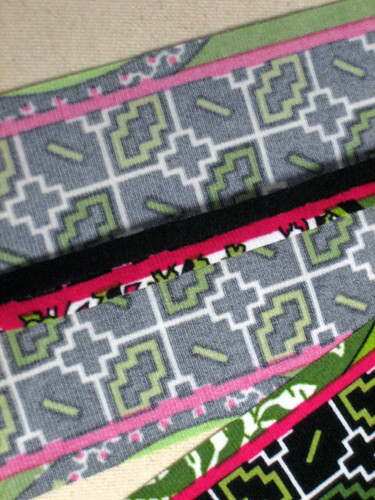 I wanted them to match the print of the midriff inset which is cut from a crosswise piece of the print. The lengthwise stripe is only a single stripe while the crosswise stripe is double so I had to piece it so that it would match. Because I only wanted a narrow fuchsia stripe along the length I cut my seam allowances at the center 1/4″ from the outside of the fuchsia stripe and it’s mate 1/4″ from the inside of the fuchsia stripe – hopefully the pictures illustrate what I’m talking about. When sewn you will see a fuchsia stripe on the right side and on the seam allowance of the wrong side. I decided to not make the ties match the midriff exactly. 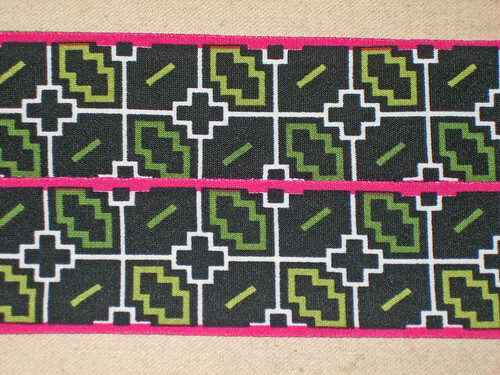 Instead, for interest, I made the ties with a fuchsia striped border. Once everything is pieced together you can hardly tell! I tried to be very careful about matching everything up. I know you are probably wondering why I did not border the midriff inset with fuchsia, aren’t you? Well, I am pretty short-waisted and didn’t want an additional 1/4″ in length so (instead of doing the right thing and removing 1/8″ from the top and the skirt to compensate) I basically took the easy way out and omitted the fuchsia stripe (which I’m now sorry about because it is pretty). 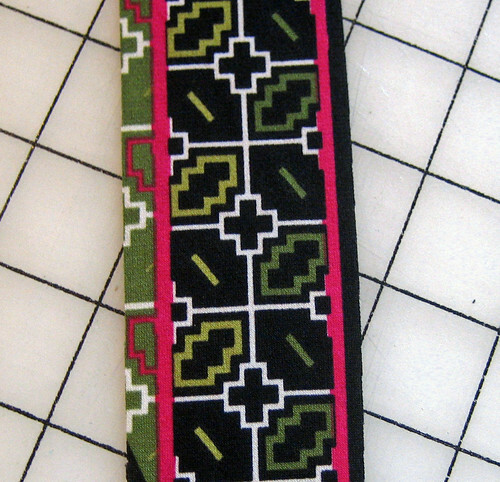 Because I just had enough of the striped border for the ties I backed them with a different part of the print. I also did not have as much length as the pattern called for – and didn’t want to purchase a lot more yardage to get it – so these will probably tie to the back only. Since I’d already used 5 yards of fabric for this dress I really didn’t want to order more. Not that any of my huge scraps will go to waste! I am going to make a top like this one that Ann made. I love the way she cut the print for a completely different look! I think it’s very artsy. See Ann’s review of this top HERE. My extra fabric arrived last Friday so I’m finally able to work on my dress this week (make sure you hit the back button to come back here). 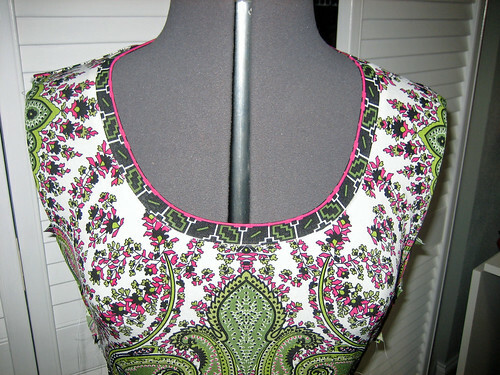 I didn’t have much sewing time today but I was able to assemble the front and back pieces and bind the neckline. It’s been said before but I’ll say it again: the neckline is very low even for someone like me who likes a very open neck (this is the HP Cosmopolitan Dress – a favorite). I raised it up by 1″ at the center front and added a ribbing-style finish and it’s perfect. Had I wanted to use a facing, a binding or simply turn in and topstitch it would have been too low. Remember too that a heavy knit will drag the neckline down even more. Best to make it higher and then trim off the excess later. I am off teeny bits here and there with my pattern matching but overall I am very happy with the way this is turning out. The print is so busy that I doubt anyone will notice my little 1/8″ flubs. I am very annoyed that the binding is not centered! I was very careful to align everything but the fabric must have shifted and I did not notice until I was finished serging. No way was I going to take all that stitching out! My fault for not machine-tacking it. Hopefully I will have some time tomorrow to get to work on those ties. There will be some piecing involved and I want to make sure it is perfect. 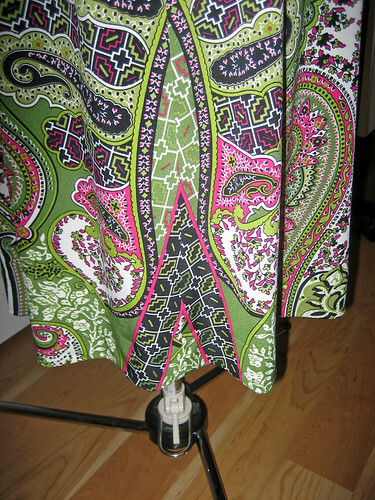 Then I just have the sleeves, side seams and the hem – woohoo! 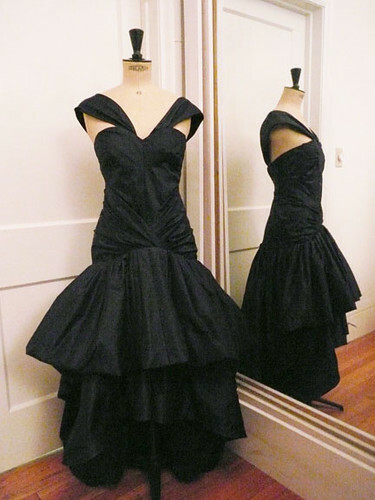 Here are a few more views the midnight blue taffeta prom dress, Vogue 2889. For more construction details see my review at PatternReview. 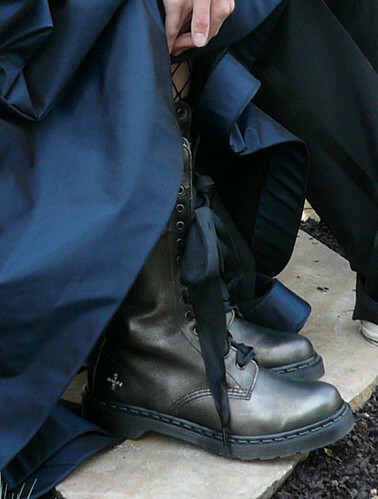 A friend who spent a lot of time in London suggested some glam Doc Martens 14 eyelet boots instead of teetering on heels all evening. DD was enthusiastic about it, so these sequin trim boots are my graduation present to her. Since the event was in San Francisco, she needed a jacket of some sort. 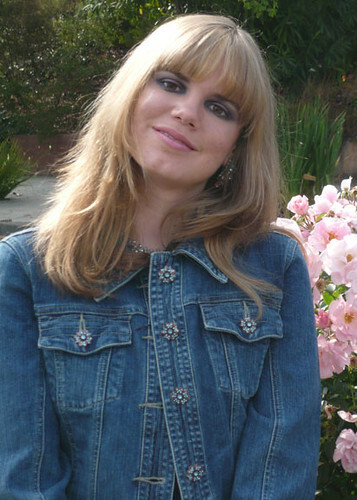 We found a shapely denim jacket and changed to rhinestone buttons. It was all very fun, and worth the big effort to get this gown from idea to reality.